THE OFFICE OF CULTURE AND TOURISM IN LALIBELA is a provincial branch of Authority for Research and Conservation of Cultural Heritage (ARCCH), the national body of cultural management under the umbrella of the Ministry of Culture and Tourism. Head of this ARCCH’s branch, situated in Lalibela and with mandate to supervise and coordinate the management of the heritage sites in this province in collaboration with responsible at location, is Woyzerit Adera, and the Head priest for all churches in this Lasta is Abba Haile Gabriel, a highly intelligent and pious monk, deeply committed to the issue of heritage management and the acute need to stop the accelerating decay of these churches and its art. 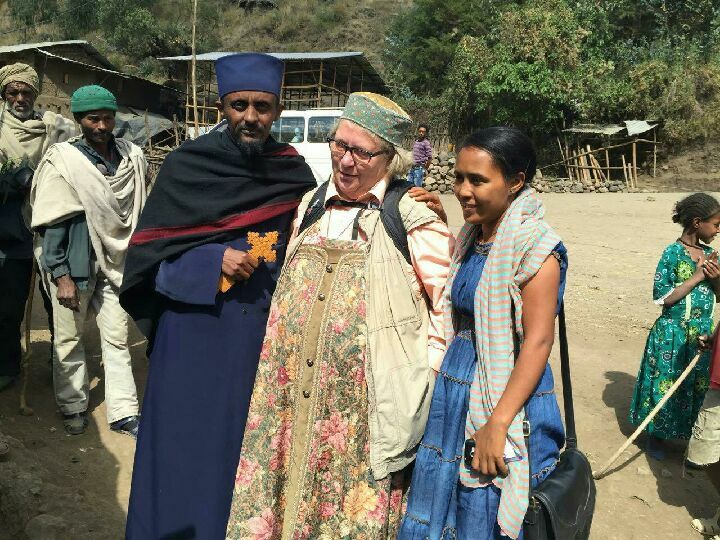 In the photo above we see the both of them guiding Madame Helena Nikkanen, appointed Chief Restorer in SCECH’s conservation team for the planned Yimrihane Kristos (YK) project, on her visit to Lalibela and the site of YK in October 2015. In Ethiopia, precisely as in Sweden and the rest of Europe, it is the local church and the local society, which are the owners and responsible for the management of the local cultural heritage with authority over this and its future. Even though SCECH since several years has an ongoing discussion on national level, which also has happened officially during several workshops with representatives from governmental, ecclesiastical and academical institution on account of the alarming state of decay of Ethiopia’s cultural heritage – not least the huge amount of ancient wall paintings in the Ethiopian highlands – most important for us is the dialogue with the local people. Accordingly, and crucial for the preparatory work of the Pilot project of conservation and education, this discussion has firstly taken place in the village of Yimrihane Kristos with the local people, the council of the society and the council of the clergy in YK. The dialogue with these about different issues connected to the conservation and heritage management of their site has been going on since several years, conducted by SCECH’s project Manager Lars Gerdmar together with Ato Mengistu Gobezei, our contact person in YK and a son of the village, before, during and after our preliminary examination here in October 2012. This ongoing discussion has, in an enlarged form, also happened during a consultative meeting held in Lalibela in May 2015 between a delegation of SCECH, headed by the Chairman in our society, Professor Samuel Rubenson, and representatives for the cultural, communal and ecclesiastical authorities in Lalibela and Yimrihane Kristos. In August and September this year a delegation of five key figures of this local group in Lasta is invited to us in Sweden in order to learn from ongoing projects of conservation here and to discuss details in a plan for the Yimrihana Kristos Pilot project, as well as the future of this heritage site after finalized conservation.